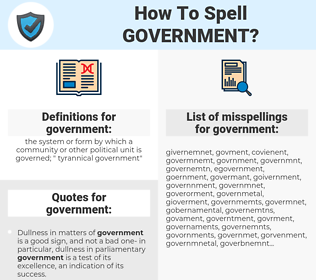 What are the misspellings for government? What are the common mistypes for government? What are the quotes for government? What are the rhymes for government? What are the translations for government? 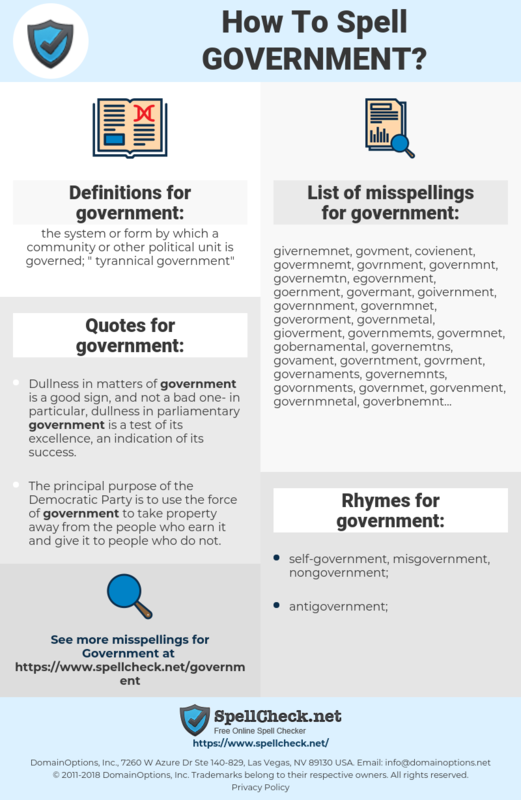 What are the common typos for government? the system or form by which a community or other political unit is governed; "tyrannical government"
This graph shows how "government" have occurred between 1800 and 2008 in a corpus of English books. Dullness in matters of government is a good sign, and not a bad one- in particular, dullness in parliamentary government is a test of its excellence, an indication of its success. I would love to go back and help rebuild that country and help- you know, kind of like what's going on with Iraq right now. You know, they've got a new government in place. They're trying to rebuild the country. I would love for that to happen in Cuba also. direction, autorités, gouvernementale, administratif, ministériel. staatlich, Regierung, Regime, Landesregierung, Gouvernement. 政府, 政治, 政, ガバメント, 与党, よとう, お上, 御上, 治国, せいじ, まつりごと, とうち, ちこく. governo, governamental, estatal, governativa, administração pública, sistema político, governamentais, públicas, nacionais.